Provide safe and high quality product to the customers according to its intended use. 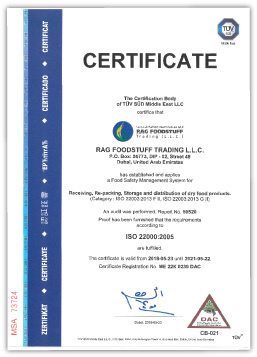 Follow the Statutory, Regulatory, Codex Alimentarius Guidelines and ISO 22000:2005 (FSMS) Food Safety Management System standard requirements in operations. Ensuring that all food handlers are trained and follow food hygiene standards, creating thereby, a food safety culture within the organization. Continually improve and update the Food Safety Management System requirements, adoption of new ideas and technologies to improve the product quality & safety. Communicate, implement and maintain Food Safety Policy at all levels of the organization and set annual measurable Food Safety Objectives to ensure continuous improvement. 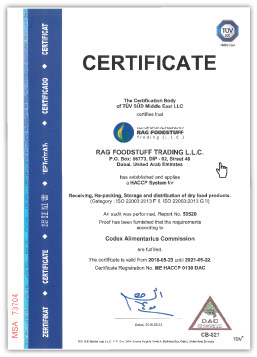 RAG Foodstuff Trading LLC . Dubai had International Quality Standards Certifications like ISO22000:2005', HACCP and also Grade A Certification from Dubai Municipality.